with No Material Extraction needed. 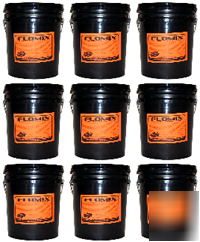 FloMix® is used to repair asphalt potholes, alligatoring, cracking, joint erosion, and surface compaction (ruts). Stops reflective cracking! FloMix is absolutely unaffected by temperature, either softening or frost/thaw. Durable Repairs That Will Outlast The Surrounding Pavement! · Simple one hour application eliminates dig-outs and multiple days construction. This substantially reduces labor expense, inconvenience, and potential construction liability. · Simple application procedures allow non-paving professionals to provide surface equal to or better than the best hot application of asphalt. · Application can be done with simple tools, eliminating the need for dig-out tools, asphalt delivery and compaction machinery. Repairs can be completed in a matter of minutes, using only 4 simple steps. STEP 1: The area is prepped by simply sweeping (or using a leaf blower or compressed air) to remove loose dirt and debris. Angular aggregate is added for deep pothole repair. STEP 3: Mixed product in the form of a pourable slurry is laid down in a matter of seconds and its thermal viscous reaction is already working. Use of tape/paper is optional if you desire to "shape" your final repair. STEP 4: Included Topping sand is applied to enhance traction and aesthetics. Ready for Traffic! In about an hour the area is open to traffic and fully restored with no chance of any tripping hazards and costly lawsuits. When complete, the repair blends with the surrounding pavement. Originally developed for NATO/USAF as a rapid runway repair material, FLOMIX® (and FLEXSET®, a rapid concrete-repair material) have become an inexpensive alternative to traditional asphalt pothole and concrete restoration procedures. This innovative, patent-pending process provides a modern solution for an age-old problem. FLOMIX® repairs are guaranteed to outlast the pre-existing surface. Department of Transportation Approved By Material Labs and Maintenance Departments For Our U.S. Airports, Highways, Bridges and Roads. FLOMIX® Provides A Long Term Load Bearing Rapid Repair Solution For Your Asphalt Restoration Needs. A rapid asphalt repair supplied in five gallon kits for reconstruction of deteriorated asphalt with NO ASPHALT REMOVAL . Suitable for narrow or wide cracks, alligatoring, and pot-holes. Repairs support load, restore aggregate interlock, improve ride, and blend in visually with surrounding pavement. Need a different quantity? Single kit, multiple Kits, partial or full palette, and multiple Palette quantities are also available - Check out my other items! We may be contacted the following ways: David Jennings . Emails are typically returned within 1 hour during normal business hours. Business Hours: 8am to 8pm central time zone.